Christmas is right around the corner, and that means Christmas card season is here! Why not design your own cards this year for a personal touch? These six websites will help you design your cards, whether you want to add photos, use stock cards, send them out yourself, have them sent out for you, or do it all electronically. And maybe best of all, they’re significantly cheaper than cards you’d buy in a store. Be sure to share your favorite Christmas card sites in the comments below! In addition to being one of the biggest photo sharing sites The 10 Most Affordable Sites for Printing Digital Photos Online The 10 Most Affordable Sites for Printing Digital Photos Online Printed photos are way better than staring at a digital screen. But why print at a one-hour photo shop when you can get them printed online and delivered? Read More out there, Shutterfly offers a huge variety of Christmas cards—just under 900, at the time of writing. Religious, non-religious, foil stamped, multi-fold, shaped, square, even cards that double as Christmas ornaments. There are so many designs that you’ll certainly be able find one that works perfectly for you. The number that you buy will determine how much you pay; once you get above 75 or so, the price starts to get down below $2. Then just add a greeting, a picture (or several pictures Online Photo Albums: Where to Host Them for Free Online Photo Albums: Where to Host Them for Free Which online photo storage service is the best? Between free price tags, unlimited storage space, and photo security, which service is best for you? Read More ), and include a message on the inside; you can even choose the envelope and liner. Finalize your order, and Shutterfly will ship them to you to be addressed, stamped, and sent on their way. There are always lots of deals and online coupons The 3 Best Online Coupon Sites to Save You Money The 3 Best Online Coupon Sites to Save You Money Coupon sites are one of the best and easiest ways to save when shopping online. From quick deals to guides on how to control your budget, here are the best coupon resources on the Web. Read More to help you save on Shutterfly cards too, so this can be a very economical option. Like Shutterfly, Tiny Prints gives you a lot of options for creating your card with a picture of yourself or your family, including some that double as Christmas ornaments, too. Tiny Prints’ laser-cut cards stand out from the rest of the options out there, and they also offer a number of foil-stamped designs to add some sparkle to your holiday season. Trim and color options, letterpress, glitter, and other options let you customize your holiday greeting to suit you or your family’s style. As with Shutterfly, the pricing depends on the options you choose and how many you order, so you can pay just about whatever you want. The more you order, the better your pricing will be. One of the best things about CardStore is that you can have them mail your cards Forgot An Event? Send A Quick Card Or Gift From Your iPhone Forgot An Event? Send A Quick Card Or Gift From Your iPhone In the digital age, you have far fewer excuses for forgetting an important event — but when you do, you also have a lot more options for making up for it! Read More directly out to all of your recipients, saving you the time it takes to address and stamp all of those envelopes. Just upload the list of recipients, and they’ll each receive a copy of your card. You can also have all of your cards sent to your nearest Target store to be printed at a Kodak photo kiosk so you can pick them up without waiting for shipping. If you’re not sold on the idea of including your picture on the front of the card, CardStore has a lot of stock options that you’ll like, from goofy character cards to more classic holiday greetings. And, of course, you can choose from a wide variety of sizes, formats, and designs to get the Christmas card that’s perfect for you. Another company that will mail your cards for you, Postable is dedicated to bringing you high-quality, good-looking cards that will stand out from the rest (they’re also 100% recycled, which is nice). Both photo cards and non-photo cards are available, and simple flat cards start at $2. And the interface for typing your cards is as simple as can be. There are tons of e-card sites out there, but Punchbowl is one of my personal favorites—there’s an opening animation, and you can customize the envelope and liner, but there isn’t any hokey music or falling snowflakes all over the screen. Just a very nice-looking, customizable card that you can send to anyone with ease. 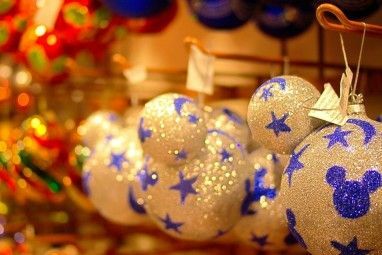 And because there are tons of free options, you can keep your Christmas communications costs to a reasonable amount this year. You’ll need a membership to send any cards customized with your photos, but plans are very affordable; they start at $1.50 per month. 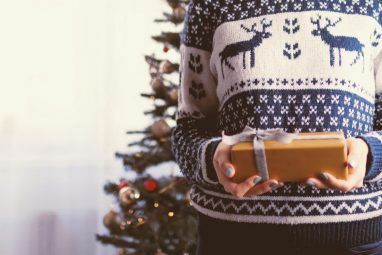 Punchbowl also lets you send digital gift cards 3 Last-Minute Digital Gifts That Don't Require Shipping 3 Last-Minute Digital Gifts That Don't Require Shipping Need a last-minute gift? Going digital may be your only hope for timely arrival. 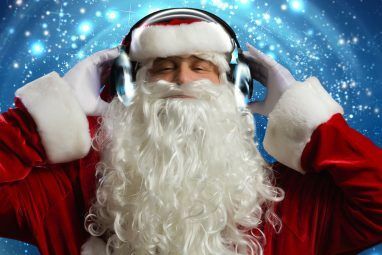 Here are the best last-minute digital gift ideas. Read More with your holiday greeting, so you can include a last-minute present or a quick thank you to someone special in your life. There are even business-themed Christmas cards that you can upload your logo to if you want a more professional card. 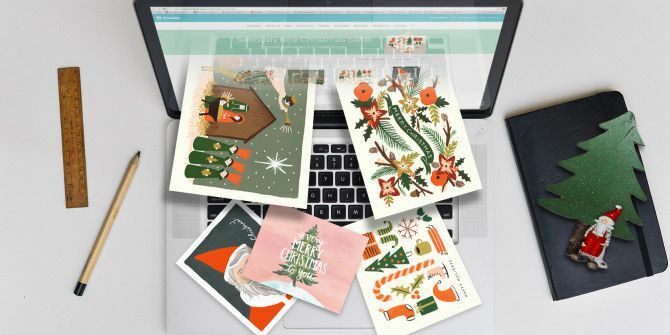 With some of the nicest-looking e-cards out there, Paperless Post is a great option for anyone who wants to send out thoughtful e-greetings that look like high-quality paper ones. While the Paperless Post cards aren’t free, they’re very reasonably priced. The card that I customized, for example, would have cost about $1.20, making it significantly less expensive than a paper greeting (and you get some site credit for free when you sign up). Your recipients will appreciate the high quality of the e-cards, and there are tons to choose from, so you can send the perfect card to everyone in your family. Paperless Post also offers a surprisingly large number of typefaces and colors, letting you customize your card exactly how you want it. These six sites are some of the best out there, but there are a lot more sites that will let you customize your own Christmas cards. Which are your favorites? Do you prefer paper cards, or have you switched over to e-cards? Share your thoughts below!